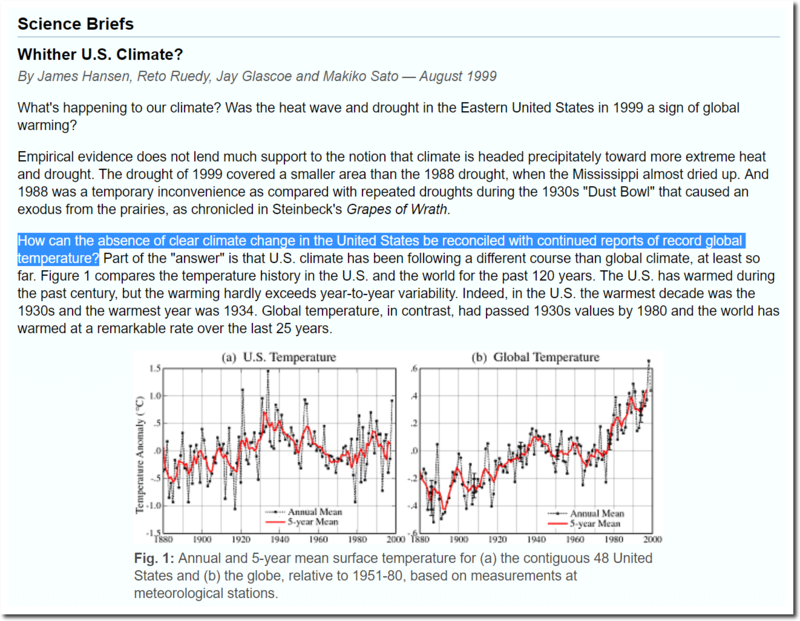 NOAA has known for 30 years that the US is not warming. 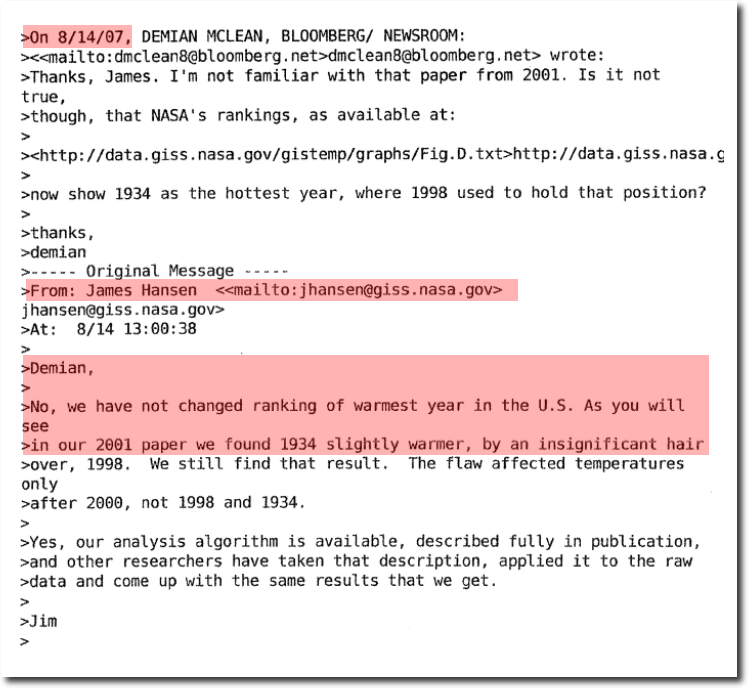 In 1999, NASA’s James Hansen was concerned that the very high quality US temperature record didn’t match Hansen’s fake global warming trend. How can the absence of clear climate change in the United States be reconciled with continued reports of record global temperature? 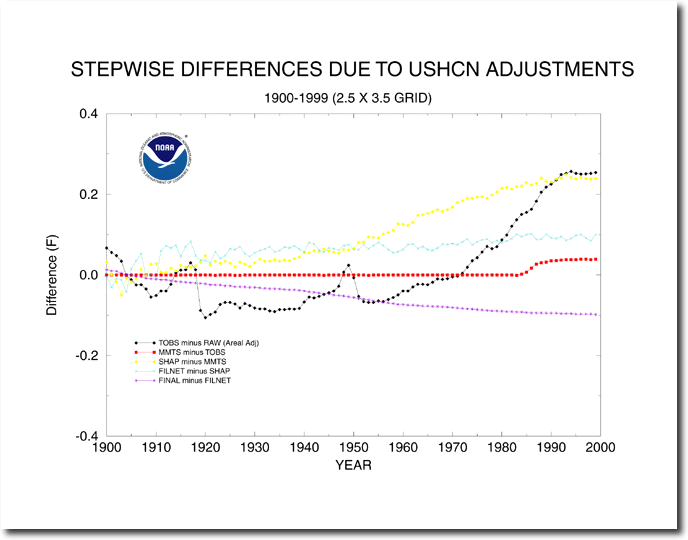 Part of the “answer” is that U.S. climate has been following a different course than global climate, at least so far. 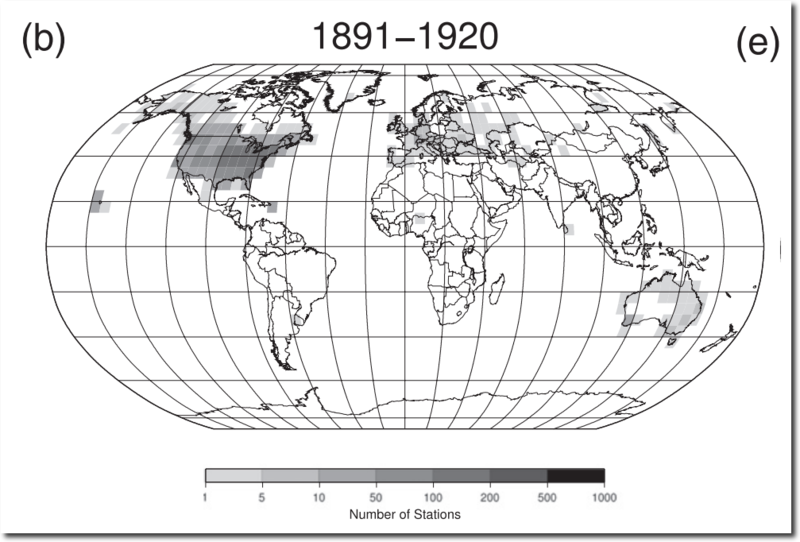 Figure 1 compares the temperature history in the U.S. and the world for the past 120 years. This was particularly troubling, because the vast majority of high quality stations are located in the US, and most of the world actually has no reliable long term data. 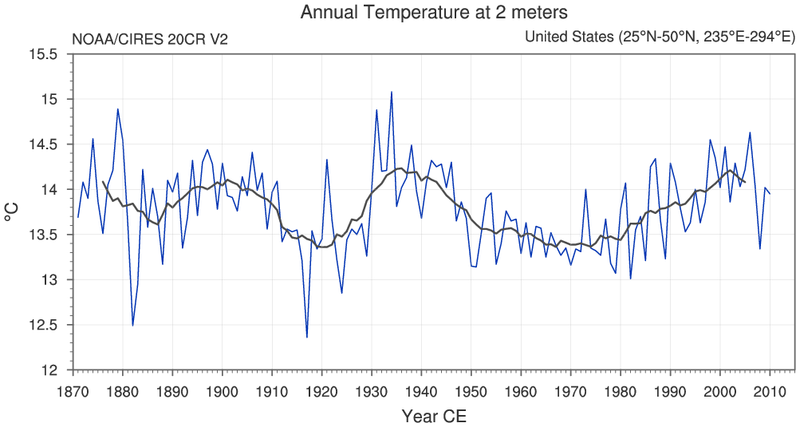 Hansen resolved the problem by knocking more than 0.5C off 1934, and adding nearly that much on to 1998 – thus turning US cooling into warming. Then he lied about it to journalists. 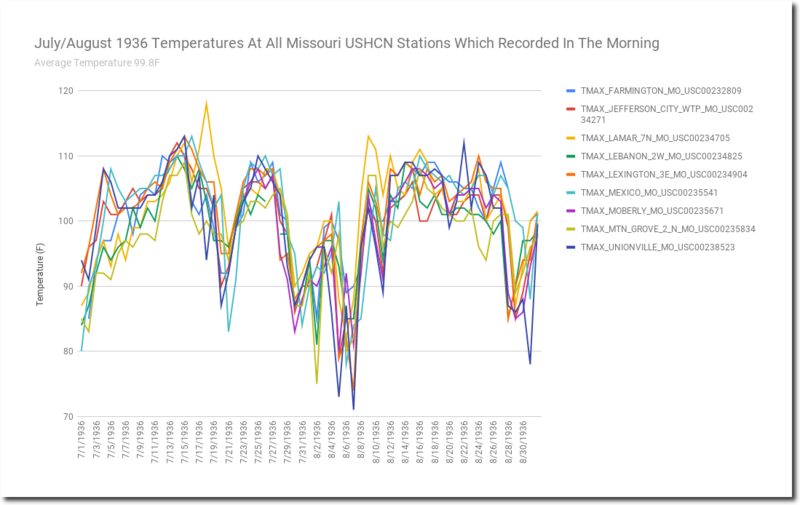 The data tampering on the world’s highest quality data set is very impressive, turning 90 years of cooling into warming. A lot of this is done using the Time Of Observation Bias (TOBS) adjustment – which started as 0.3F, and later magically changed into 0.3C. 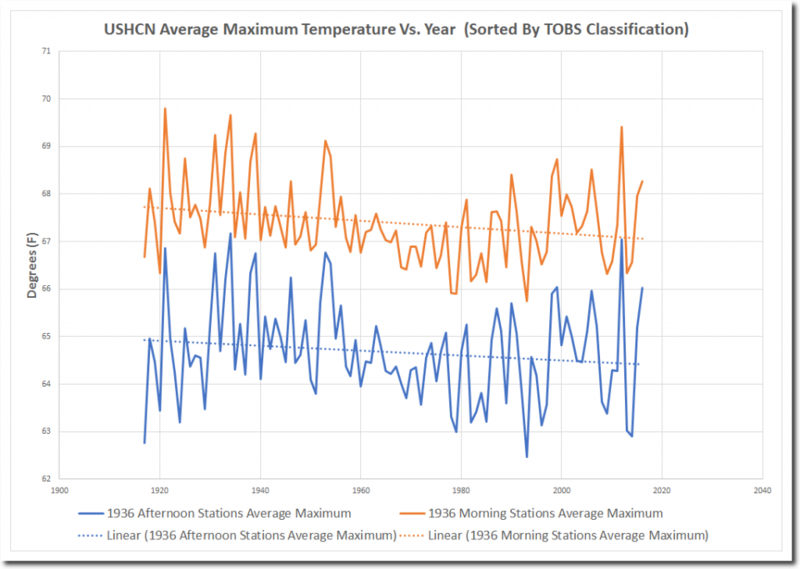 The TOBS adjustment is based on the theory that if you reset your min/max thermometer in the afternoon, you will double count some hot days – and that people used to reset thermometers in the afternoon, but now do it in the morning. 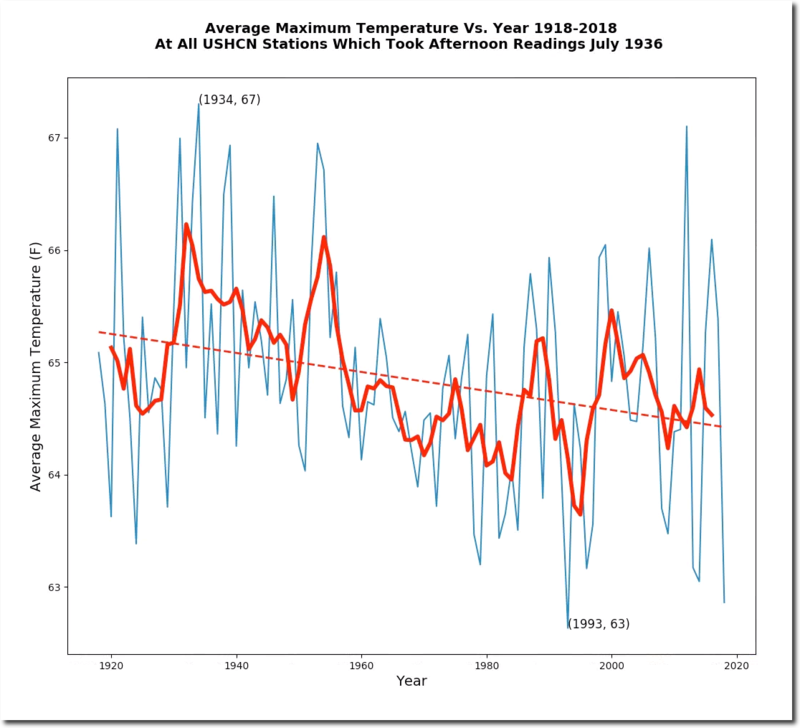 This is easy enough to test out, by comparing trends at stations which took their readings in the morning or night during July 1936, versus stations which took their readings in the afternoon. The data shows that there is no difference in the trends between the two groups of stations. Both data sets show a sharp decline in maximum temperatures. 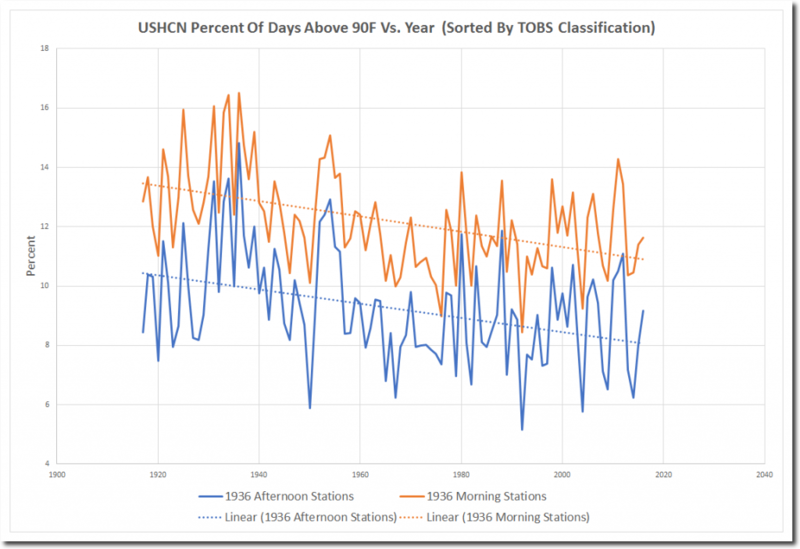 The only difference is that morning stations tend to be hotter, because they tend to be located at lower latitudes where people like to go outside earlier. 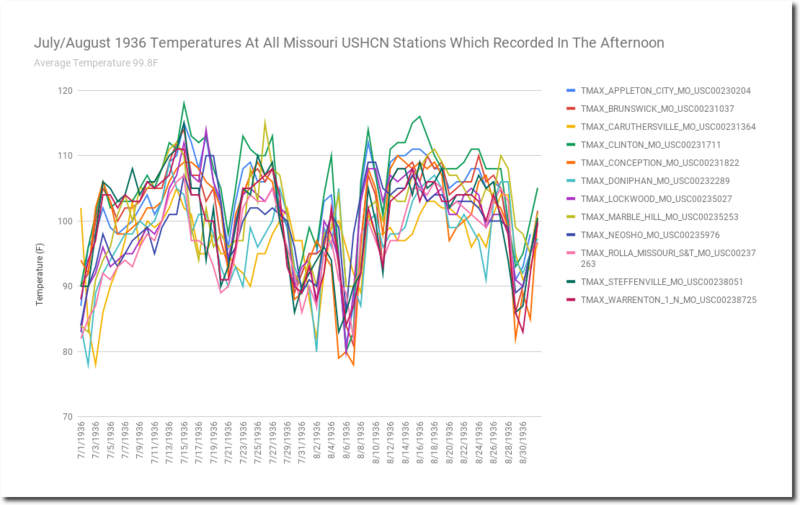 Looking specifically at Missouri temperatures during July/August 1936, there is no difference in temperatures between the two groups. Both averaged 99.8 degrees. 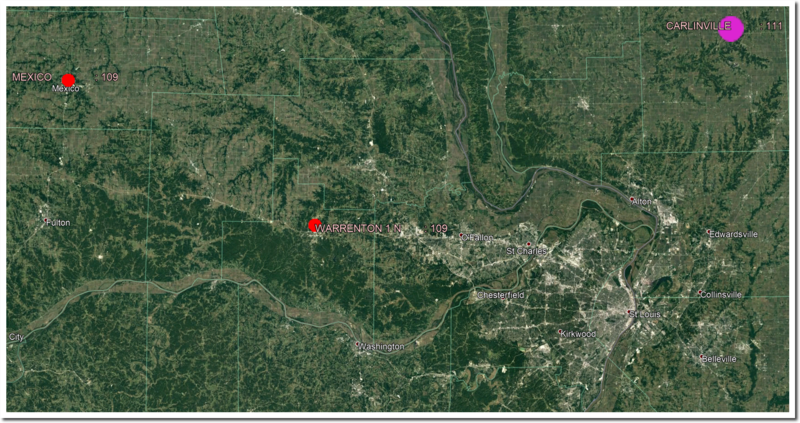 Compare vs July 2018, which has seen no 100 degree days in Missouri, and an average temperature of 89.8 degrees – ten degrees cooler than 1936. Mexico, Missouri took their readings in the morning, and averaged 101 degrees during July/August 1936. Warrenton, Missouri took their readings in the afternoon, and averaged 100 degrees. 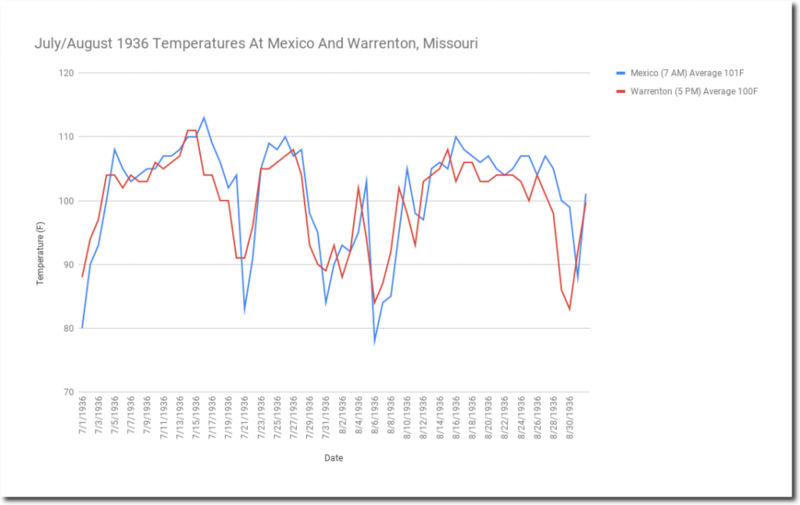 One difference is that the morning station (Mexico) tends to be shifted by a day, because they report maximum temperatures from the day before. For example on this date (July 29) in 1930, Mexico, Missouri reported 113 degrees when none of the other stations came close to that. The really hot day was July 28. 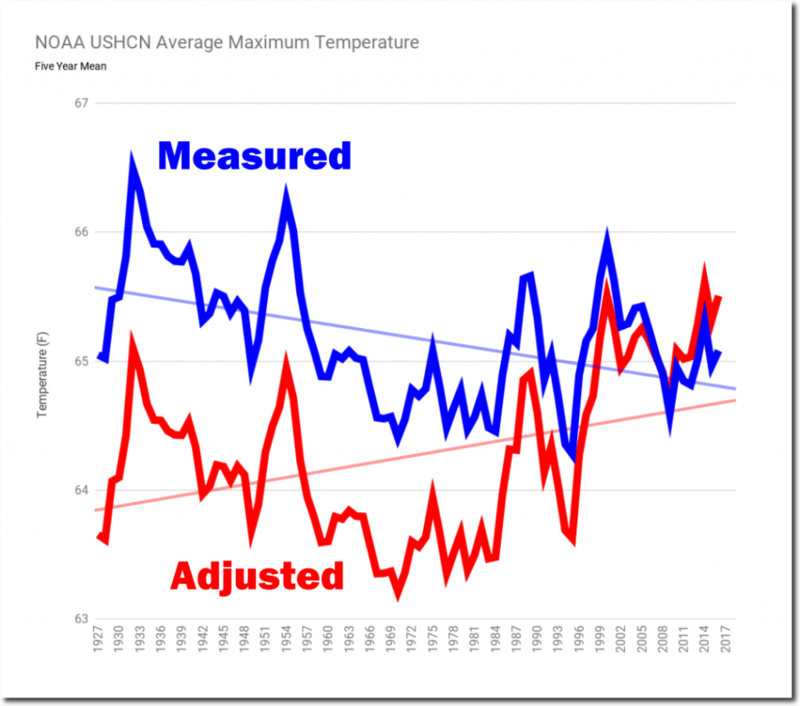 The bottom line is that the NOAA US temperature adjustments are completely fraudulent and destroy perceptions of the US temperature trend. 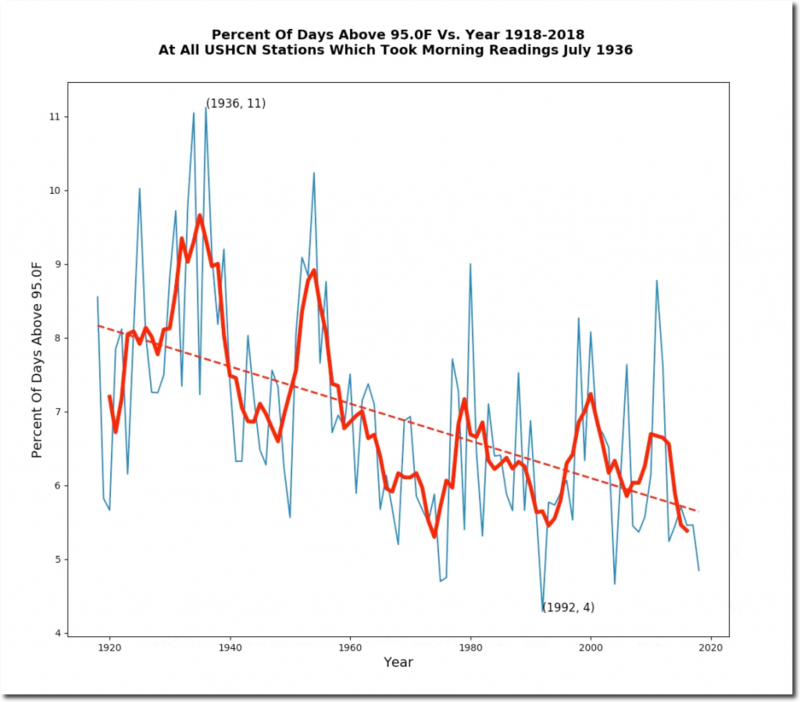 They turn a long term cooling trend into a long term warming trend. 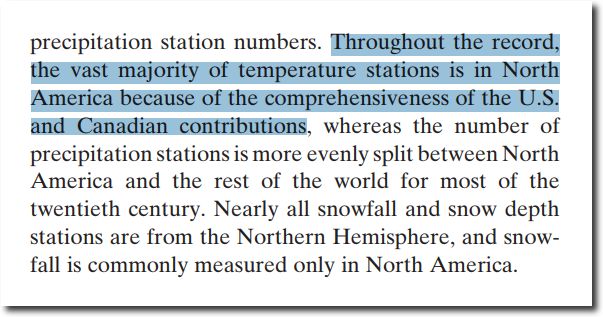 And this was done to justify the even more fraudulent global temperature record. 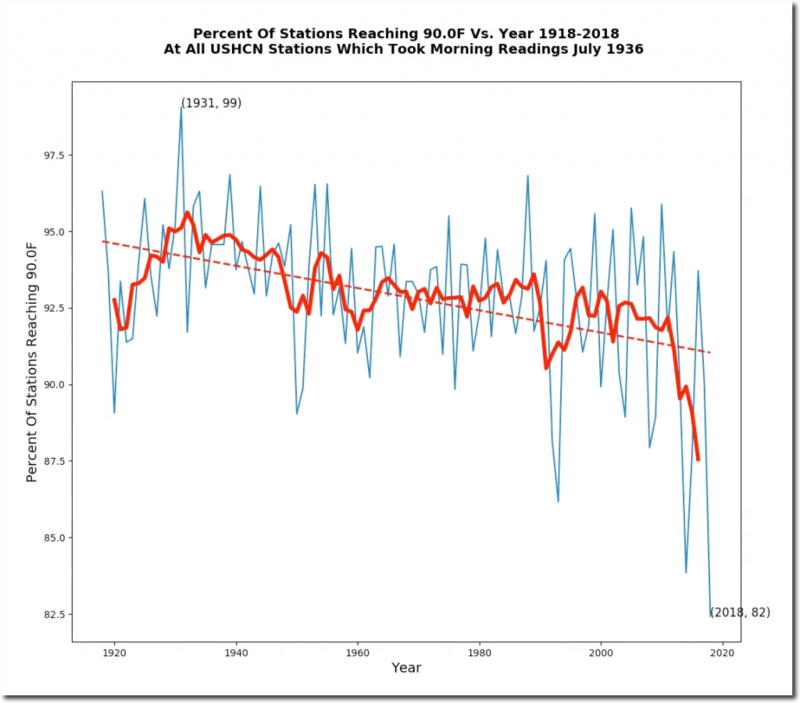 How do the fraudsters know what the temperature of the ocean was pre-satellite when there is no temperature stations for most of the ocean at least? I have concluded that they can fudge the numbers, using a model of course, to fit the narrative of climate change. 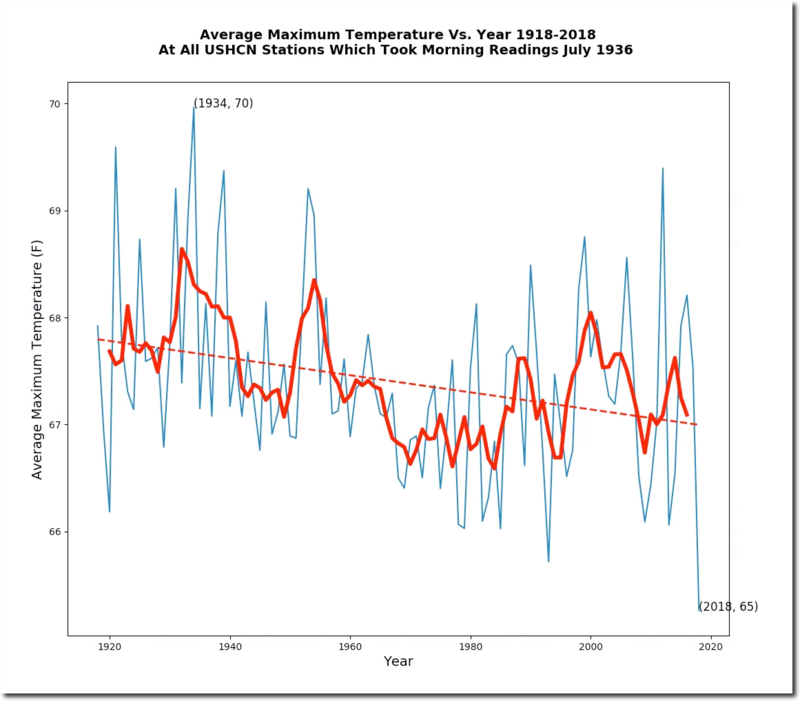 It is surprising that global temperatures are even allowed to be considered authentic prior to the satellite age, and even then, with any accuracy until the ocean buoys were in use by 2004. Well, must be because our national mainstream media continues to shrill that everyone is suffering from the dramatic climate change that can be seen and felt in every corner of the US. Oh, I believe that Obama said that as well. I really hope the raw data is stored somewhere outside the control of the alarmists or it may not end up being disappeared. If I recall correctly from the East Angelia emails, all of their original, unadjusted data was inexplicably “lost” (one of the reasons the readme.txt author could not reproduce their own results). And my understanding is that all the alleged (minimal) global warming is due to peripheral spots like the Arctic where the leftists fill in the blanks for the data. On top of that is that urban areas across the globe have been subject to a profound urban heat effect. On top of that is all the glaring “adjustments” as mentioned in this post, sharply cooling the past and heating the present. 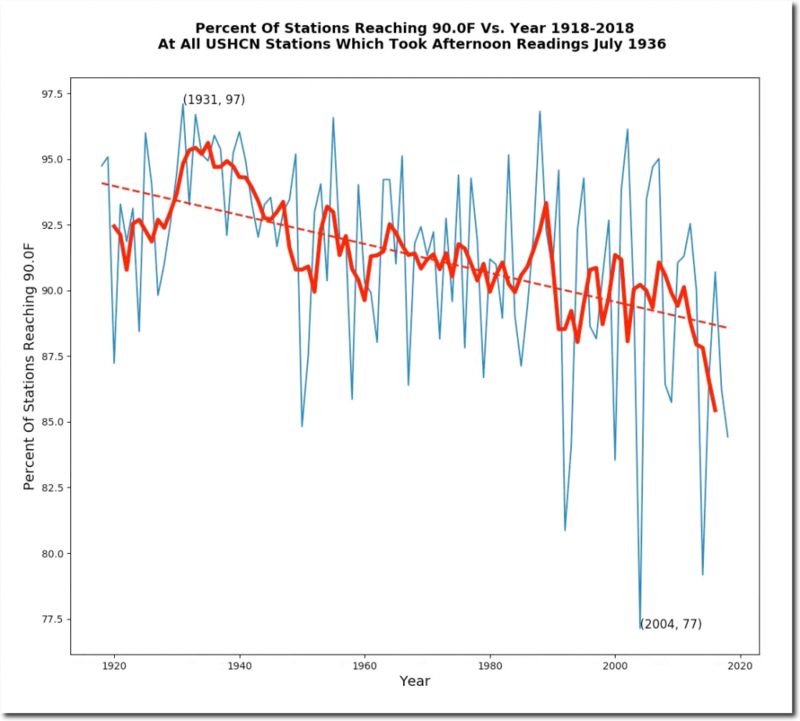 I don’t think there been, in reality, any warming at all globally for the last 100 years. “Climate change” is a leftist scam. and are critical in judging the reality of the facts , like you Tony . Donot despair at observing so much falseness and injustice . 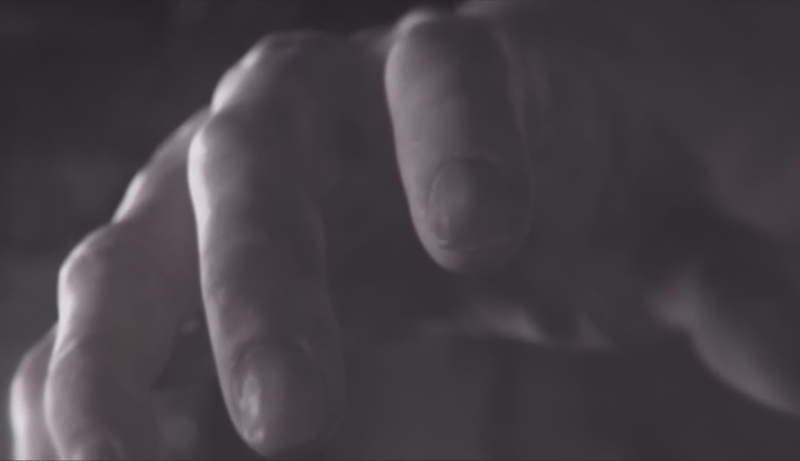 Finally these creepy followers will be taken down by their own deeds , although it may take a while ………. M@nn-Made Global Warming? More like M@ann-Made-Up Global Warming. Greatest scientific fraud in history. In the past they would burn witches at the stake. 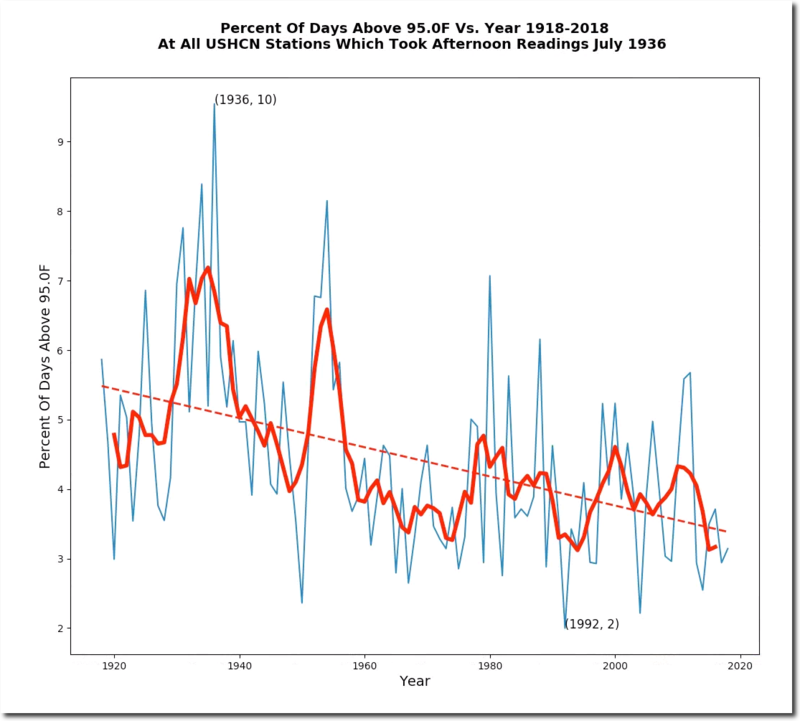 We need to start the process again and use the cons of manmade global warming as the witches, James Hansen would be first, as the male known as Mr. Strong, is already in HE double hockey sticks, Sen. Worth is second. I’m sorry, but this article and your entire website are all a bunch of nonsense. One plus one equals three, we all know this. I have further evidence you’re wrong, with some links that in no way refute your arguments, along with some arguments that defy basic logic. So there. I was trying to cover during Griff’s self-imposed exile. How did I do? As the saying goes, a Griff’s work is never done. You matched or even surpassed Ms Griff on substance but you must improve your work discipline. She never slept and she always strived to be the first. Carbon dioxide kills women, children, minorities and the proletariat. You must get better to bring about glorious progressive future. Haha, excellent critique! Yes, I’ll strive to be obsessed with Tony’s website, hovering here until an article is posted and jumping in to be first to post (a bit scary when you think about it). Uh, Griff, if you’re reading, it’s all for fun and we love you! 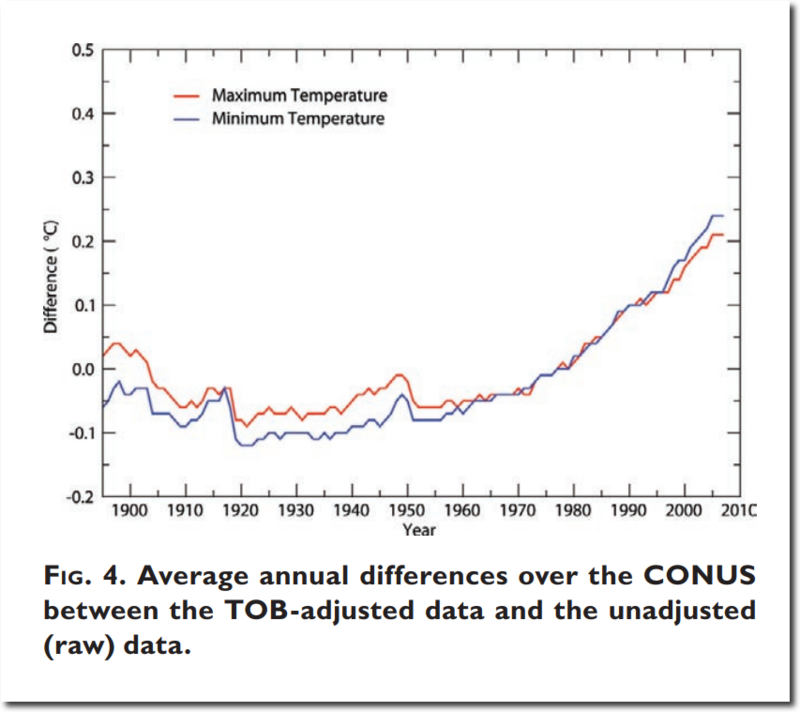 NOAA has it (or had it) right up to 2010. @Brian D: Very important graph! Where can I find it to show GWllible family members, so that they can’t claim it’s “just made up by deniers”? Compared to Time of Observation, Urban Heat Island effect is quite large But they give that no credence. If anything shows their hand, it is that simple fact. I have tried to reach you several times without luck, so i hope you will contact me on my email.